Video poker was first introduced to land-based casinos in the 1970s and became instantly popular. To this day it remains one of the most loved casino games for those who prefer games of skill, with the perfect combination of a low house edge and the possibility of big wins. The solitary format makes it the ideal casino game to play online – read on to find out more about the rules of video poker and where to play for real money online. You’ll find many variations of video poker at our recommended online casinos as well as at mobile casinos for iOS and Android. If you’re new to the game of poker, video poker games are a great place to start before moving on to more detailed table poker games like Texas Hold’em or live dealer poker. Video poker is a computerised casino game based on the rules of five card poker, with many game variants available. While these games are nowhere near as visually pleasing or innovative as virtual table games or online slots, they use a clean, simple format which is easy to use and understand. Unlike a majority of casino games based entirely on chance, video poker is one of the rare exceptions where players really have a chance to beat the odds. Choosing games with generous pay tables and applying the right amount of player skill can see players taking in returns of up to 100%. To play video poker for real money you’ll need to register for an account with one of our recommended online casinos. These reputable venues are all safe and secure and offer a good range of video poker games to try out. Make sure to select your preferred currency when signing up, most casinos will offer a range of currency including AUD, USD, CAD, EUR, GBP and NZD. Once you’ve signed in, you’ll need to deposit funds to your casino account in order to place real money wagers. Video poker games can also be played for free in demo mode so you can get a feel for the gameplay format before deciding to move on to place a real money bet. Click on the video poker game of your choice and select the bet you wish to place. Press the ‘deal’ button to receive cards, click on the cards to ‘hold’ those you wish to keep and then click the ‘draw’ button to receive new cards. To double your bet, gamble or collect, simply click these options at any time they become available. Jacks or Better Poker – this is the most common video poker variant you’ll find. The name of this game derives from the fact payouts begin at a pair of Jacks. All American Poker – a high return game, it is very similar to Jacks or Better except the payouts for straights, flushes and straight flushes are increased, while payouts for full houses and two pairs is decreased. Tens or Better Poker – same as Jacks or better but with payouts beginning at a pair of tens instead or pair of Jacks. Joker’s Wild Poker – this game variant adds a joker card to the mix, which is used as a wild card and is used as a substitute to improve the strength of your hand. Deuce’s Wild Poker – in this game, twos become the wild card and can be substituted with any other card to make a better hand. Deuce’s Wild has one of the highest returns in video poker when proper strategy is utilised. Bonus Poker – this is the same as Jacks or Better but with a higher payout percentage on a Four of a Kind hand. 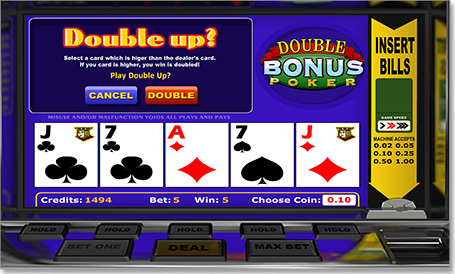 Double Bonus Poker – another variant the same as Jacks or Better but with a bonus payout for any hand consisting of four aces. Aces and Eights – like Jacks or Better but with a higher payout for any Four of a Kind made up of Aces or eights. Aces and Faces – follows the rules of Jacks or Better but with higher payouts for any Four of a Kind made up of face cards (Kings, Queens, Jacks) or aces. Video poker is closely related to the invention of the slot machine, with the original slot machine first being patented around the late 19th Century by Charles Fey. After the booming popularity of Fey’s Liberty Bell machine, many inventors tried to get on board to coin the next biggest thing in gambling machines. It wasn’t until the ’70s when the concept of personal computers started to emerge that the first video poker machine was created. The man behind video poker was Sid Reed, a distributor who was working for Bally’s casino at the time. He pitched the idea of an electronic version of five card draw poker that worked in a similar fashion to the slots but Bally’s shut his idea down. Reed took his patent to the Fortune Coin Company in Reno who helped him form a new company and mass produce his video poker machine, a move Bally’s must have regretted for decades. By 1981 this game had become the most popular new addition to the casino industry. To this day the original version of Jacks or Better video poker remains one of the most popular and commonly found game in bricks and mortar casinos, with its prevalence now spreading online. For a full list of the best video poker sites catering to players from your country, refer to our casino table above which has been geo-targeted to recognise your location and only recommend online casinos that accept players from your region. To find out more about the online gambling laws that apply to you, read our guide to international gambling laws.